Anywhere you pull your boat in, you are immediately part of the community. Some communities are somewhat closed off to transients, and some are made entirely of transients. For small vessels, the tiny anchorage of Yerba Buena in the middle of San Francisco Bay is mostly transient. If you draft over a fathom, entry and exits are solely based on high tide. We arrived yesterday and have met shorthanded sailors from all sides of the spectrum: Clayton is living bare-bones on his 24' sloop, with his girlfriend and their cat. Right after we arrived he immediately rowed over to borrow my climbing harness, as he had skied his main halyard yesterday morning. Fisher went over to help him and was joined by Skip, a sailor/fisherman who fishes off San Miguel, holds the fish alive in a tank he built into his center cockpit, and sells them alive to restaurants in Santa Barbara for about $10/lb. Hello World came in from Napa, then our friends from Aquatic Park, Eric, from Switzerland, and his girlfriend Mika, from Japan, came in as well. 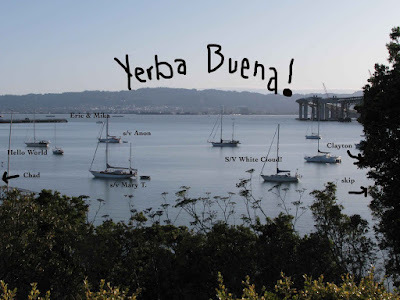 Yerba Buena was an excellent place to avoid gale force winds last night, without getting so deep into the bay that we couldn't make a quick departure when the weather cleared. We also met Sigmund aboard s/v Mary T. Sigmund and Skip know these harbors well, as they know all the Baja harbors. They have different views and experiences and gave us many tips for our journey south. We have shared charts and info with Erik & Mika. They made us a loaf of sourdough bread. Today I joined Hello World and the crew of the 48' C&C Landfall, s/v Anon, on the bus to downtown. They are going off to check out the Hardly Strictly Bluegrass Festival at Golden Gate Park. That park is amazing. There's a wide range ($$$) of boats in this cove, but we're all on a budget and out to enjoy the free things that San Francisco has to offer. It's unique - seeing people with floating homes that range between probably $5K and $200K - all trying to maintain a similar daily budget.